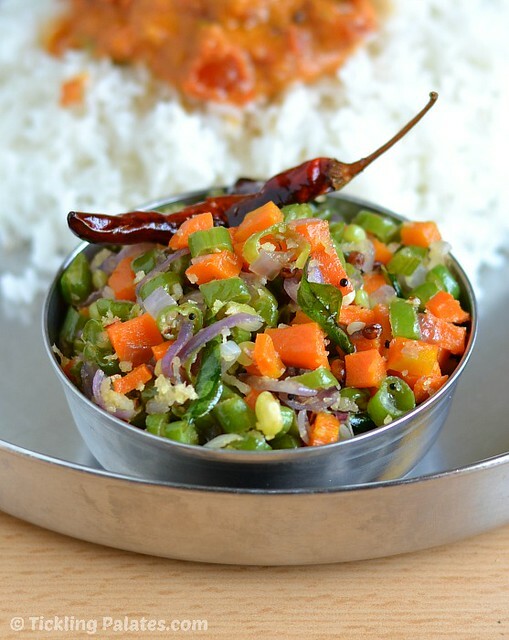 Carrot Beans Poriyal (stir fry) also known as Thoran in Kerala is a very simple side dish that’s served along with rice for lunch. 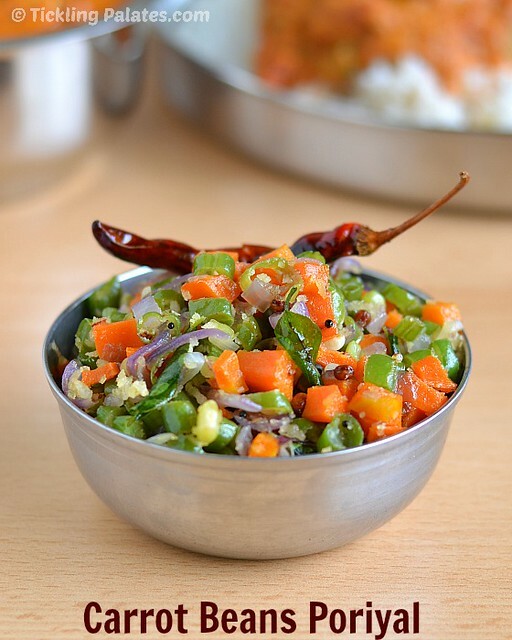 While the poriyal is served as a accompaniment in some wedding lunches in Tamilnadu, the carrot beans thoran finds a place in the Onam Sadhya in neighboring Kerala. This quick and easy stir fry is a medley of flavors and colors that’s light on stomach as well. If you are a diabetic or on a diet, make sure to skip the grated coconut and the addition of coconut oil in this recipe and also if you are game, you can finish up this entire cooking process in the microwave itself by just using 1/2 tsp of oil while seasoning. You can cook the entire dish in coconut oil itself. If you are worried about calories, use regular cooking oil. Using coconut oil at the end is optional but it imparts an authentic flavor to the dish. Make sure that you use fresh grated coconut to get a nice flavor and aroma. 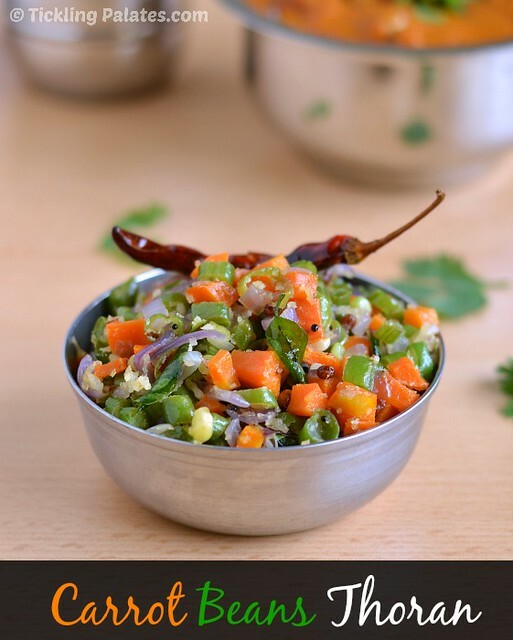 Make sure that you chop the carrots and beans of equal thickness for even cooking. If you are looking for more poriyal recipes to serve with rice as side dish, try Kantola fry, potato thuvarai curry, cauliflower milagu pirattal, vazhakkai podimas, kovakkai curry and kothavarangai paruppu usili. 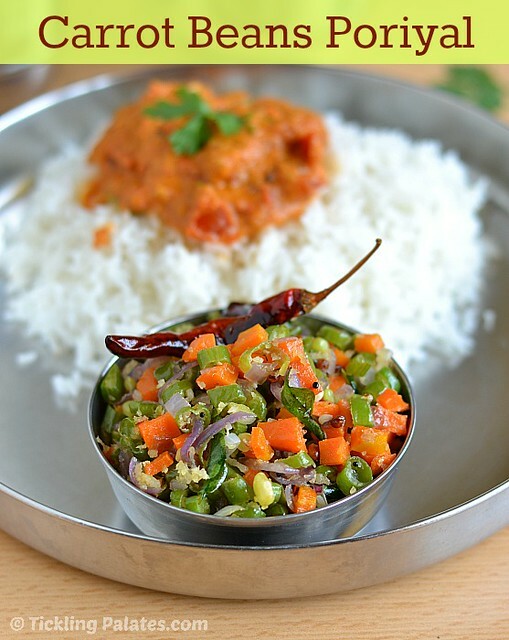 Carrot Beans Poriyal - served as a side dish with rice. Wash carrots and beans. Trim the ends of the carrots and lightly scrape its skin. Chop into fine, small cubes and keep aside. Trim the ends of beans and remove the strings if any. Chop finely and keep aside. Chop the onions finely. Place both the carrots and beans in a microwave proof bowl. Close it with a lid leaving a small gap. Microwave for 2 mins at high. Mix after every minute to ensure even cooking. The vegetables should be partly cooked with a crunch to them. You can also do this step on stove top. Heat a pan with oil. Add mustard seeds and when they splutter, add urad dal, asafetida, curry leaves, whole dry red chilies and sauté till the urad dal becomes golden. Add onions and sauté over medium flame till the onions becomes translucent. Add the partly cooked carrot and beans, salt and mix well. Close the pan with a lid and cook for 3 to 4 mins. Add grated coconut, mix well. Drizzle coconut oil of using on top. Mix well, take off fire. Keep the pan closed with a lid for 2-3 mins for the coconut oil flavor to get imbibed. Serve as an accompaniment with steaming hot rice. i love this a lot! Very colourful presentation.. This is gorgeous!! I would love to try this! Deicious and healthy looking poriyal. What a blissful combi ..Radhika.. I m returning to blogging after two years now.. Do stop by my space when time permits. My mom makes the similar way..beautiful clicks..
i try it…very tasty tq for the recipe.